The Rangers, Reds, Cubs, and Tigers all rank among the top 10 in steals, but all that running has only Chicago and Detroit moving in the right direction. Thirty years ago, jackrabbits filled Major League Baseball’s landscape. Combining blinding speed and deadly on-base skills with atypical power, Rickey Henderson and Tim Raines racked up huge stolen-base totals and became superstar leadoff men. Less talented but still exciting speedsters like Vince Coleman stole bases at mind-boggling rates, too. The ’80s were dominated not only by power hitters and power pitchers, but also by blazingly fast runners. That speed trend waned over the next two decades, as steal totals around the league fell by nearly 30 percent from the mid-’80s to the mid-’00s. Instead, baseball become a home run derby that valued sluggers above all else (thanks to PEDs and other factors). But that era quickly came and went as well. Today, power numbers have fallen and teams have begun to pay more attention to all-around athletes who can play great defense and master the running game. This week’s four featured teams all rank among baseball’s top 10 in stolen bases. One of them has emerged as one of baseball’s most pleasant surprises by parlaying a rush of young talent, a new manager, and a more aggressive running style into one of the best records in the league. So today, let us honor those teams and players who evoke memories of the go-go ’80s and the human missiles who once electrified baseball fans. January 6, 2011, was a happy day for Dan Uggla. After being traded from the low-budget Marlins to the perennially contending Braves a few weeks prior, he signed the richest deal ever given to an Atlanta player: a five-year, $62 million contract extension. Coming off four straight 30-homer seasons, Uggla seemed an ideal candidate to energize the middle of the order and fuel more success in Atlanta. It turns out that this moment also marked the very peak of Uggla’s career. He cranked 36 homers in his first season as a Brave, but the rest of his numbers fizzled, as he set career lows in batting average and on-base percentage in his first season in Atlanta. In 2012, things got worse: a then-career-low batting average of .220 and only 19 home runs. Then, in 2013, the bottom dropped out. The Braves gave Uggla 537 plate appearances, and he rewarded them by hitting a microscopic .179, tying Rob Deer for the lowest batting average by any qualified hitter in 100 years. With the benefit of hindsight, we can see how it all went wrong. Uggla was a late bloomer who didn’t make his major league debut until age 26, and that’s a red flag when it comes to a player’s odds of sustained success. He was also a terrible fielder who lacked speed and quickness, and one-dimensional sluggers tend to age poorly compared with multitool talents. The Braves were banking on that skill set aging well during Uggla’s age-31 to -35 seasons, and it backfired. 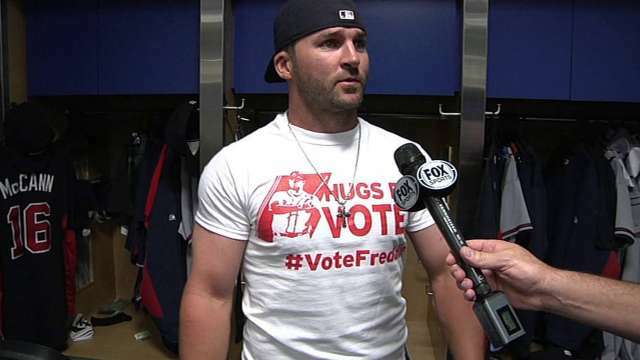 While Atlanta fans once cheered Uggla’s musclebound game and “smedium” attire, they now rained down boos on his head. By the time the Braves released him on July 18, 2014, Uggla had become one of the most reviled players in franchise history. Given that the Braves paid him $62 million, it’s tough to call this revenge. But losing the skill that once made you a star, getting booed by your home fans, and then getting kicked to the curb by a team with whom you imagined ending your career still had to hurt. Whatever we want to call it, if this was the last big moment in Uggla’s career, it was a glorious way to go out. The Brewers change skippers, but that probably won’t be enough to save Milwaukee or any of the other teams bringing up the rear. For as much as they’ve struggled since the beginning of last season, the Rangers do run well — and they’ve done so for a while. Go back to 2009, and you’ll see that the Rangers first flourished under Ron Washington when they started running. From Opening Day of that season to today, Texas ranks third among all teams in stolen bases. And by Baserunning Runs,1Texas ranks sixth among all clubs over the past six-plus seasons. This measures the number of runs above (or below) average that a team generates with its legs. Washington and his hyperaggressive baserunning style are gone, but many of the same speedy athletes remain. Fleet-footed center fielder and leadoff man Leonys Martin leads the team in both steals and Baserunning Runs in 2015, and he’s on pace to set new career highs in both stats. Led by Martin and outfielder Jake Smolinski, the Rangers rank ninth in steals and seventh in Baserunning Runs. However, unlike this week’s other featured teams, all of that speed and baserunning prowess has meant virtually nothing for Texas. For the second straight year, the Rangers can’t catch a break. Just as they did in 2014, pitching injuries have strip-mined the Rangers’ roster. Yu Darvish’s season-ending elbow injury would have been a devastating blow to any team, but Derek Holland is out until at least mid-June with a shoulder injury, and previous injuries have prevented guys like Martin Perez, Matt Harrison, and Nick Tepesch from throwing any innings at all. Despite the attrition, the pitching staff has managed to hover around league average in park-adjusted ERA and a smidge worse by park-adjusted Fielding Independent Pitching. But don’t count on this lasting: When your best pitcher is Nick Martinez (0.84 ERA, but also just 13 strikeouts in 32 innings), you’re living on borrowed time. If the Rangers are going to improve, any uptick will likely come from their offense, which has been a black hole through the first four weeks. Texas hitters have batted just .216/.300/.336 this season, the third-worst mark in the majors on a park-adjusted basis. Martin’s got all of those steals, but he’s also batting just .221/.255/.298. Elvis Andrus is hitting a measly .228/.282/.307/, Shin-Soo Choo just .147/.272/.309/, Rougned Odor .146/.263/.244, Robinson Chirinos .154/.250/.327, and Adrian Beltre .218/.269/.337. None of that’s going to last: Beltre has too long a track record of success to keep struggling this badly. Choo and Andrus are two of the most overpaid players in the game, but they’re not this bad.2 Odor and Chirinos are still somewhat untested commodities, but both fared much better a year ago and both are getting hammered by sub-.200 batting averages on balls in play. The Rangers rank 29th in BABIP, and some of those balls have to start falling. Granted, Choo has dealt with back problems this year, and it’s possible he’s not fully healthy yet after his injury-plagued 2014 campaign. In addition to luck-related improvement, Mitch Moreland could be back in a week, after elbow surgery derailed his hot start. And while Josh Hamilton is long removed from being the player who won an MVP with Texas in 2010, he can certainly still help the team with the worst record in the American League. For the downtrodden, still-running Rangers, it’s hard to see how things could get any worse. Last year’s champs and one of this year’s most popular sleepers both languish in this tier. As with the Rangers, there’s nothing new about the Reds running wild. Last year, Cincinnati finished third in the big leagues in steals, and this year they’re trailing only the Astros.3 Better still, they’ve been outrageously effective when they try to run, stealing 29 bases and getting caught just once all year. The Astros are apparently going to finish 154-8 and win the next 10 World Series, so second might be as good as it gets for the mortal 29 other ballclubs. Unfortunately, Cincy’s biggest base-stealing threat can barely make it to first. If he could get on at even a league-average rate, Billy Hamilton would be an excellent all-around player. In the first half of last season, Hamilton hit .285/.319/.423, while swiping 38 bases and playing excellent defense across 90 games, making himself the heavy favorite to win NL Rookie of the Year honors. But a second-half blitz by Mets right-hander Jacob deGrom, combined with a collapse in Hamilton’s numbers, scuttled those hopes: Hamilton batted a miserable .200/.254/.257 after the 2014 All-Star break, and his park-adjusted numbers (by OPS+) sunk from 9 percent better than league average before the break to 51 percent worse after. This year, he’s looked like that second-half version of himself. Through his first 21 games, Hamilton’s hitting just .204/.260/.333. Squint, and you can see very subtle signs of progress: His walk rate’s up slightly compared with last year (6.9 percent, versus 5.6 percent), and he���s swinging at slightly fewer pitches out of the strike zone. But the biggest knock on Hamilton remains exactly what prospect evaluators questioned as he blazed his way through the minors: his inability to hit the ball hard. Listed at 6-foot, 160 pounds, Hamilton is one of the slightest players in the majors. Per ESPN research, he posted a hard-hit rate4 of just 9.2 percent, the second-lowest figure among 146 qualified batters in 2014. Yet, Hamilton overcame that lack of pop by leveraging his speed to produce 19 infield hits (11th in the National League) and 17 bunt hits (second in the NL) for a BABIP (.304) five points higher than league average. As you’d expect, hard-hit rate simply measures the frequency with which a batter hits the ball hard. Except, relying on dinks, dunks, and bunts hasn’t shown itself to be a sustainable approach. With a 7.5 percent hard-hit rate,5 Hamilton’s hitting the ball hard even less frequently this season, and the dinks, dunks, and bunts are no longer working. He’s managed just two infield hits and zero bunt hits this year, plunging his BABIP to .236. That he’s still been able to swipe 13 bases (in 14 attempts!) is amazing, but just imagine the damage he could do if he got on base consistently. The eighth-worst mark among 181 batting-title qualifiers. The Reds sit below .500 for numerous reasons, including Homer Bailey’s season-ending elbow injury, Devin Mesoraco not catching a single game this season, the non–Aroldis Chapman parts of the bullpen springing holes everywhere, and Marlon Byrd turning into a pumpkin. But when your leadoff man is nearly an automatic out, that’s a tough obstacle to overcome — no matter how fast he might be. This deep tier includes multiple quality teams that haven’t yet ascended to elite status. After a monstrous 2014 and a huge start to 2015, Anthony Rizzo might be one of the 10 best position players in baseball. While the 25-year-old has always had an excellent batting eye, he’s taken his pitch selection to the next level this year, drawing 15 walks against just 13 strikeouts in 102 plate appearances. He’s also goosed his OBP skills by becoming a hit-by-pitch machine, leading the majors with eight plunks. Add that up and you have a lofty line of .321/.471/.513, which makes Rizzo one of the most potent hitters in the majors. But here’s the thing: The 6-foot-3, 240-pounder has also started wreaking havoc on the basepaths. Through 24 games, Rizzo has stolen six bases, tying a career high set in 2012, when he played 160 games. How does that happen? Rizzo deserves lots of credit for using smarts and instincts to overcome his so-so speed, but his increased stolen-base threat is really part of a teamwide effort to get out and run. After ranking just 23rd in stolen bases in 2014, the Cubs have zoomed all the way up to third. With Joe Maddon, the Cubs found a skipper well known in Tampa Bay for devouring psychology books, sipping Merlot, and encouraging clubhouse craziness. More quietly, though, he also presided over some of the most prolific and most effective base-stealing teams in baseball. From 2008 through 2014, the Rays led the majors in steals and ranked third in Baserunning Runs. That’s what’s now happening on the North Side of Chicago. The Cubs don’t have the kind of prototypical speedster you’d expect to challenge for stolen-base titles, but players like Rizzo, Dexter Fowler, and even hulking rookie third baseman Kris Bryant are testing opponents’ arms, and the aggression is paying off. With 26 steals in 34 tries, the Cubs trail only the Astros and Reds for the best success rate of clubs with 20 attempts or more. Throw in the sixth-highest Baserunning Runs total in the majors,6 and the Cubs are proving you can win games by running — even if you’re not all that fast. To be fair, Chicago ranked seventh in Baserunning Runs in 2014. You can only hope to contain them. You know that 2008-14 period we just talked about? When Maddon’s Rays dominated the baserunning game? Over that same seven-season stretch, the Tigers ranked 28th in Baserunning Runs and last in stolen bases. However, due to a handful of acquisitions over the past two seasons, the once-plodding Tigers are now fourth in the majors in steals. Signing Rajai Davis to a two-year deal in December 2013 gave Detroit someone fast enough and aggressive enough to rank among baseball’s most impactful baserunners despite not being an everyday player. This year, they’ve paired Davis with Anthony Gose, who came over in an offseason trade with Toronto, to create the speediest position timeshare in the game.7 In addition to the center-field sprinters, Ian Kinsler — past his prime and sitting on zero homers this year — remains a skilled baserunner who should be good for about 15 steals. And then there’s Jose Iglesias. Even if we have to pretend that Gose didn’t cost the team Devon Travis, who’s hitting like an All-Star with the Jays in his rookie season. For a team that could mash but struggled defensively, Iglesias represented a big potential upgrade, so expectations soared heading into 2014. Instead, thanks to stress fractures in both legs, he missed the entire season, and the severity of those injuries raised questions about the rest of his career. So far, though, the answers have all been positive: Iglesias is the biggest individual surprise in baseball. Through 25 games, the shortstop is batting .354/.400/.494. Only Michael Brantley and Jose Altuve have posted higher contact rates, and Iglesias’s ability to put the ball in play has provided a nice counterbalance to high-strikeout teammates like J.D. Martinez. Also, while he never stole more than 13 bags in any minor league season, getting on base so often has given Iglesias more chances to run: He’s already swiped five bases in six tries. Now, there’s no way Iglesias will produce at this pace all year long — he won’t keep landing 39 percent of the balls he puts in play for hits — but even a lesser version of him would be a huge upgrade over the .223/.286/.293 line and non-transcendent fielding the Tigers got out of the shortstop position last year. A high-contact bat and this kind of defensive wizardry over 140 healthy games would make the Tigers the clear favorite in the AL Central and give them as good a shot as anyone to make the World Series. Sure, this team isn’t going anywhere if Miguel Cabrera, David Price, and other big-name players don’t continue to put up huge numbers, but it’s the little guy hitting ninth in the order, scooting around the bases, and breaking hitters’ hearts with one spectacular play after another who could push them onto another plane of success.